LOT 401 - The fountain pens, two Schaffer, one Waterman. LOT 402 - Royal Stafford cup & saucer, orchard pattern. LOT 403 - Vintage Aztek style sterling silver bracelet. LOT 404 - Two Dresden figurines. LOT 405 - Small framed photo of a Ship in Vancouver. LOT 406 - Otto Kaltenbach Altensteig flatware service. LOT 407 - Man's Alpacca design cuff bracelet. LOT 408 - Set of 2 Royal Doulton 1930's flambï¿½ bowls. LOT 409 - French 1930's silver plated clown piggy bank. LOT 410 - Canadian .925 silver bracelet set with star diopside. LOT 411 - Ladies burnished cuff bracelet. LOT 412 - Pair of silhouettes. LOT 413 - Be Not Content by William J. Craddock-Doubleday. LOT 414 - Tall oak finished shelf. LOT 415 - Oil painting signed Andersen, "Still Life". LOT 416 - Watercolour signed C. Stegeman, "Abstract Face". LOT 417 - Leather briefcase- circa 1960. LOT 418 - Decorative shield back armchair. LOT 419 - Oil on canvas signed Ken Faulkes, 30 1/2" x 20", "The Model". LOT 420 - Teak two piece cabinet. LOT 421 - Pen drawing indistinctly signed, "Wheels". LOT 422 - Set of two Danish style chairs with cushions. LOT 423 - Oil on masonite signed (Martin) White-Beaven, 17 1/2" x 23", "Old Farm House-Elora". LOT 424 - Framed photograph of Duke Ellington. LOT 425 - Framed print signed possibly Basaylia '95, "Figures". LOT 426 - G.E.multi-band mantel radio. LOT 427 - Teak table. LOT 428 - Carved walnut side chair with needlework seat. LOT 429 - Danish end table with tile top. LOT 430 - Oil on board signed W. Teurlinds, "Coastal House Boats". LOT 431 - Etching 39/75 signed Komysky,15"x 10.5", "Untitled (man with horn)". LOT 432 - Teak two piece cabinet. LOT 433 - Oil on board signed Rose Wiselberg, 24"x 20", "Bottled Alcohol on Tablecloth". LOT 434 - Oil on board indistinctly signed 18 3/4" x 22 1/2", "Raking Hay". LOT 435 - Serigraph, Myfanwy (Pavelic), "Queen Elizabeth". LOT 436 - Collage by Maureen Marshall, 30" x 48", "Early Cottage with Black Girl". LOT 437 - Teak two piece sideboard. LOT 438 - Lot of Art Deco Grindley china. LOT 439 - Art Deco dining table. LOT 440 - Set of five Arts & Crafts dining chairs. LOT 441 - Two watercolours; Street Scene and a Portrait. LOT 442 - Signed limited edition lithograph numbered 198/400, "Psycodelic Head with Horns and Guitar". LOT 443 - Pair of watercolours signed M.Marten 27" x 19", "Larghetto con albers" & "Albers". LOT 444 - Pair of English Derby figures. LOT 445 - Danish art pottery bowl, Yellow modern glass vase and a pottery vase. LOT 446 - Canteen of Oneida silver plated flatware- "Lilac Time" pattern. LOT 447 - Marantz Model 1530 stereo receiver. LOT 448 - Garrard Zero-100 turntable. LOT 449 - Pair of walnut Sansui SB-3500 speakers. LOT 450 - Limited edition serigraph signed M. Barry dated 1976 numbered 14/25, "Yellow Fall". LOT 451 - Vintage blue painted radio. LOT 452 - Walnut cased Philips Opera 470 radio. LOT 453 - Pair of green and gold two tier lampshades. LOT 454 - Pair of Electro-Voice Baronet Do-It-Yourself speakers with manual c.1965. LOT 455 - Framed print after Kerry Strand, "The Snail". LOT 456 - Teak file cabinet. LOT 457 - Three framed paintings of dancers. LOT 458 - Hall bench/phone table. LOT 459 - Black and chrome table lamp. LOT 460 - Small orange desk lamp. LOT 460A - Wide teak shelf. LOT 461 - Leather bound champagne bucket. LOT 462 - Teak 2 tier stepped end table. LOT 463 - Oak three drawer file cabinet. LOT 464 - Two 1950's mosaik cat pictures. LOT 465 - Walter Riedel unframed print and 2 W. Ried watercolours. LOT 466 - Philips mahogany cased two way combination. LOT 467 - Teak framed mirror. LOT 468 - 2016 ink drawing signed Mimi, 10"x 14", "Life". LOT 469 - Pair woodcuts signed Sam Black, 6 1/2 x 8" "Boats". LOT 470 - Pair of hand stitched pillows. LOT 471 - Art pottery vase. LOT 472 - Set of 4 stacking teak and tile top tables. LOT 473 - Brass bound two drawer coffee table. LOT 474 - Italian style marble and metal floorlamp. LOT 475 - Walnut cased Westinghouse mantle radio. LOT 476 - Teak two tier drinks cart. LOT 477 - Thomas Kinkaid oil print - "Evening at the cabin". LOT 478 - Turkish rug. LOT 479 - Watercolour signed Rashida 1987, 12.25"x 9", Untitled (figures). LOT 480 - Two section teak settee. LOT 481 - Bowl by Wayne Ngan, 12". LOT 482 - Bent wire candle holder. LOT 483 - 1960's English orange modern glass vase. LOT 484 - Teak credenza. LOT 485 - Lithograph attributed to Michael Snow, 6.25"x 9.5", "Untitled (trees, flower in landscape)". LOT 486 - Asian hand stitched saddle bag. LOT 487 - Glass side table. LOT 488 - Egyptian style ottoman. LOT 489 - Watercolour signed Rashida 1988, 7.5"x 10", "Lovers". LOT 490 - Etching signed F.(Flemming) Jorgensen numb.74/100, , 3"x 3 3/4", "Untitled-Geometric Forms"
LOT 491 - Pair of Italian style stools. LOT 492 - Ladder back rope seated chair. LOT 493 - Modern designed desk with run off. LOT 494 - China part dessert service, "Fontainebleau". LOT 495 - Teak draw leaf table and six chairs. LOT 496 - Ash night stand. LOT 497 - Shag style carpet. LOT 498 - Teak magazine side table. LOT 499 - Edison standing mahogany cased gramophone. LOT 500 - Framed print after Tretchikoff. LOT 501 - Victorian style walnut occasional chair. LOT 502 - Women's golden silk outfit. LOT 503 - Watercolour signed Archie Gillies, "Iris". LOT 504 - Set of seven Victorian mahogany chairs including carver. LOT 505 - Decorative Spanish style cabinet. LOT 506 - Oak Morris style chair. LOT 507 - Waterfall styled night stand. LOT 508 - Large drawing of a telephone and shoes. LOT 509 - Watercolour signed Kit, "Still Life". LOT 510 - Watercolour signed Della Paranich, 25"x 13", "Island". LOT 511 - Watercolour signed "S", "Trees". LOT 512 - Art Deco display cabinet with glass shelves and key. LOT 513 - Orange 1970's style highback armchair and matching stool. LOT 514 - Watercolour signed Hilda Macleod, 17" x 13", "Purple Irises". LOT 515 - Indistinctly signed oil painting, "Mountain View". LOT 516 - Print signed Ralf Berry, "Sandpipers". LOT 517 - Oil on board signed (Carlos) Ariaga, 22"x 28", "The World of Pansies". LOT 518 - Brass-glass top sofa table. LOT 519 - French style print on canvas. LOT 520 - Metal framed glass top coffee table. LOT 521 - Acrylic on canvas signed T. Curver-Briggs '90, 36.5"x 36", "Chanced Encounters". LOT 522 - Framed mirror - Vogue design. LOT 523 - Pencil collage att.to Dennis Burton (Issacs Gallery) d.7/8/62, 17"x 22 1/2", "White Heather". LOT 524 - Oil on canvas indistinctly signed, "Street Scene". LOT 525 - Framed floral print of a tulip. LOT 526 - Marble top teak wall cupboard. LOT 527 - One tube of prints. LOT 528 - Framed embroidery. LOT 529 - Glass top coffee table. LOT 530 - Set of five mounted movie posters. LOT 531 - Oil on board signed (Carlos) Ariaga, 24"x 30", "Display of Summer". LOT 532 - Framed coloured print after Rowbotham, "Lake Scene". LOT 533 - Blue leather armchair. LOT 534 - 1996 mixed media signed Karl Spreitz, 10.5"x 8.25", "Not The Blue Moon". LOT 535 - Coloured print signed Verona 1972, "Telephone". LOT 536 - Westinghouse walnut mantle radio. LOT 537 - Serpentine front mahogany chest of drawers. LOT 538 - Oil on canvas signed Denise Bourdousche, 23"x 28", "La Terrasse"
LOT 539 - 1997 Oil on board signed Noah Becker, 10.75"x 8", "Study For Portrait/Erik Volet". LOT 540 - Graphite drawing signed Softerman, "Steuben Glass Vase". LOT 541 - Lithograph after Jules Cheret, 19.75"x 13", "Le Courrier Francais (1891)". LOT 542 - Glass topped mahogany vanity. LOT 543 - Watercolour signed Jan Lenica, 21"x 27.5", "Untitled (bird)". LOT 544 - Collage by Maureen Marshall, 24 1/2" x 18 1/2", "Cubist Man". LOT 545 - 5 tier curate. LOT 546 - Daume France glass vase. LOT 547 - Wedgwood art glass penguin, 5 1/4". LOT 548 - Ladies alligator skin hand bag, 12". LOT 549 - Alligator skin hand bag. LOT 550 - Three "tortoise shell" hair combs. LOT 551 - Watercolour signed Rashida 1988, 6.5"x 8.5", "Laila". LOT 552 - 1994 drawing signed Jaswant Guzder, 8"x 10", untitled. LOT 553 - Etching signed Rudolf Lang, 9.5"x 12.75", "Party". LOT 554 - Very large wall mirror with decorative frame. LOT 555 - Shaped front mahogany night table. LOT 556 - Crystal drop chandelier. LOT 557 - Shaped front end table with two drawers. LOT 558 - Hand painted china part tea service. LOT 559 - Circular teak table and four chairs. LOT 560 - Etching signed Toti '83, 9.5"x 9.5", "Prairie Picnic". LOT 561 - Etching 13/20 signed Toti '77, 8.5"x 8.5", "Headache". LOT 562 - Maple framed armchair. LOT 563 - West German pottery vase. LOT 564 - Decorative bronze compote marked "CA", 15". LOT 565 - Marble topped demi-lune table and matching coffee table. LOT 566 - Framed coloured abstract print. LOT 567 - Lot of four matching Portuguese china pieces. LOT 568 - Set of teak shelves. LOT 569 - Walnut bureau-bookcase. LOT 570 - Group of 3 Spode deco pieces etc. LOT 571 - Antique wall mounted light. LOT 572 - Teak two piece cabinet. LOT 573 - Pencil drawing signed Nancy Boyd dated 1989, 18"x 22", "Phone". LOT 574 - Silkscreen signed P.(Peter) Shostak, 7/30, "Left to Rust". LOT 575 - Col. engraving signed James Lindsay d. 1966, 16 1/2" x 11 1/2","Patrick Pearse Poet & Martyr". LOT 576 - Standing lamp with glass shade. LOT 577 - Two hand stitched pillows. LOT 578 - Watercolour - "Mountains". LOT 579 - Maple couch with matching armchair. LOT 580 - Carriage with Horses mantel clock. LOT 581 - Art Deco china cabinet with green lining. LOT 582 - Pair of framed coloured engravings, "Interior Scenes". LOT 583 - Set of Villeroy and Boch china dinner ware- Acapulco pattern and glasses, etc. LOT 584 - Teak draw leaf dining table and four chairs. LOT 585 - Nest of 3 stacking teak tables. LOT 586 - Mixed media signed Jon Smith May 9 76, 9"x 10.5", Untitled (abstract). LOT 587 - Artists proof etching signed Toti 79, 8.75"x 8.25", "The Present". LOT 588 - 1988 mixed media signed (Anthony) Thorn, 7"x 9.5", "Expulsion From Eden". LOT 589 - Teak hand crafted slate topped coffee table- circa 1960's, 66". LOT 590 - Enamel on copper locally made by Silmur, ashtray and a metal vase. LOT 591 - Telep walnut mantel clock. LOT 592 - Swedish Aseda blue art glass vase, 15". LOT 593 - Teak sliding stereo stand. LOT 594 - Bentwood coat rack. LOT 595 - Carved wooden sailboat and a carved wooden seal. LOT 596 - Rosewood framed miniature of a young lady with urn. LOT 597 - Italian art glass clown and a clown paperweight. LOT 598 - French bronze medallion in case- Sedan Douzy 1954. LOT 599 - Royal Copenhagen Figurine, Boy and cow. LOT 600 - Porcelain candle holder of a putti. LOT 601 - Two Noritake hand painted candle sticks. LOT 602 - Oriental ceramic dragon decorated box, 4 1/2". LOT 603 - Unusual Staffordshire figurine of a seated lady playing a concertina, 8 1/2". LOT 604 - Etching artist's proof signed Rudolf Lang, 11.5"x 15.25", "Untitled (animals in forest)". LOT 605 - Framed stone engraving of fish. LOT 606 - Black painted silk and lace framed fan. LOT 607 - Pitcher by Wayne Ngan, 7". LOT 608 - Mantel clock. LOT 609 - Italian Murano glass figure. LOT 610 - 1950's Italian Murano figure. LOT 611 - Large walnut sideboard. LOT 612 - Framed photo signed Kaloussi, "Masked lady in field". LOT 613 - 1996 mixed media signed Karl Spreitz, 9.5"x 6.5", "Lightfooted He Goes". LOT 614 - Brass octagonal shaped rectangular wall mirror. LOT 615 - 1986 watercolour signed Radisha, 7"x 4.75", "Comfort". LOT 616 - Mixed media signed K. Swannell '89, 17 3/4 "x 12", "Untitled-Laundry Room Sink". LOT 617 - Photo-lithograph signed in image Frank M.Sutcliffe, 9 1/8" x 12 1/8", "The Water Rats". LOT 618 - Lithograph 19/100 signed Vodimi (T), 17"x 18.5", "Untitled (still life)". LOT 619 - Coloured limited edition print sgnd. Michael Drew Campbell n.16/17, "High-Kam-Bull". LOT 620 - Four section Barrister's bookcase. LOT 621 - Art Deco perfume bottle with stopper. LOT 622 - Humming bird pin. LOT 623 - Italian early 20th century parasol with plated handle having a green stone, 33". LOT 624 - Art Nouveau designed porcelain dish. LOT 625 - Mexican .950 silver necklace set with semi precious stones. LOT 626 - Doulton Lambeth open salt signed FAB. LOT 627 - Serigraph 6/12 signed Ross Bollerup, 30"x 22", "Spring Mountain". LOT 628 - 1985 serigraph 13/17 signed Ross Bollerup, 30"x 22", "Rushing River". LOT 629 - Watercolour signed Rashida 1988, 7.5"x 10", "Lovers". LOT 630 - Painting signed H.Hargrove, 11 3/4" x 16 1/2", "New England Suite". LOT 631 - Oak decorative bookshelf made from a mantle. LOT 632 - Watercolour signed Baslaw, 21" x 16" , "Flowers". LOT 633 - Watercolour signed Rashida 1987, 9"x 12.5", Untitled (figures). LOT 634 - Engraving signed in plate Renoir, 5" x 3 5/8", "Two Young Girls Wearing Hats". LOT 635 - Serigraph 1/1 signed Karl Spreitz, 9.5"x 7.5", "Power Play". LOT 636 - Art Deco walnut bedroom suite. LOT 637 - Oil on canvas signed Eliza Hawkins, 30" x 40", "The Sacrifice". LOT 638 - Ltd.ed.serigraph signed Reginald Shepherd dated 1966 numbered 3/55, "Squid Jigging". LOT 639 - Mixed media collage signed Karl Spreitz '88, 6.25"x 8", "Find Yourself". LOT 640 - Two porcelain figures of babies. LOT 642 - Limited edition print signed Roger Hale dated '81, numbered 4/300, "Whistler Edition". LOT 643 - Framed woodblock print signed Eliza Hawkins, 8" x 10", "School Girls". LOT 644 - Italian blue glass decanter set. LOT 645 - Meersham pipe set, total length 30". LOT 646 - Print signed illegibly 1964, "Abstract". LOT 647 - Acrylic triptych on canvas signed (John) Koerner 54" x 78", "Pacific Gateway Series". LOT 648 - Set of three china pieces, Greek Warrior by Fenton. LOT 650 - Set of four oak chairs with leather seats. LOT 651 - Brass three branch ceiling fixture. LOT 652 - Afshari mat. LOT 653 - Hand hooked rug signed G.E.T., 27" x 35", "Cottage". LOT 654 - 8 foot oak table. LOT 655 - Set of 3 bentwood side chairs. LOT 656 - Bendix Corporation Aviation bakelite mantel radio. LOT 657 - Pair of side tables w/cabinet doors. LOT 658 - German china part dinner service for 11 and serving pieces. LOT 659 - Large set of Waterford crystal stemware. LOT 660 - Framed picture by Tang Hong Lee, "Abstract". LOT 662 - Lot of ruby glass including: shaker, cocktail glasses, shakers, pickle jar, etc. LOT 663 - Modern designed rug approx. 9' x 12'. LOT 664 - 10 piece carved mahogany dining suite. LOT 665 - Large Dutch Painted Tile signed J. Israel, 22" x 13". LOT 666 - Carved oak dining chair with black upholstered seat and back. LOT 667 - Ladies beaded evening JACKET. LOT 668 - Teak magazine rack. LOT 669 - Glass and metal frame coffee table. LOT 670 - 19th. century parian ware figure of a woman with registered mark, 13 1/2". LOT 670A - Shahsawand Asian mat. LOT 670B - Round oak Arts table with set of four chairs (4 oak leaves). LOT 671 - Cranberry art glass three branch epergne. LOT 672 - Brass studio lamp with milk glass shade. LOT 673 - Brass floorlamp. LOT 675 - Pair of hand stitched pillows. LOT 676 - Pierced walnut finished settee. LOT 677 - Teak drinks cart. LOT 678 - Antique mahogany vanity. LOT 679 - Oil on canvas signed inverso Abe Murley, 39.5"x 30", "Dinner at Bev's". LOT 680 - Oil painting of a woman. LOT 680A - Oak circular table. LOT 681 - Watercolour signed Rashida 1987, 6"x 12", Untitled (figures in landscape). LOT 682 - Watercolour signed Rashida, 12"x 8", "Mother and Child". LOT 683 - Beluchi pillow. LOT 684 - Asian runner with underlay. LOT 685 - Upholstered Chaise Lounge with pillow. LOT 686 - Teak & twine standing lamp. LOT 687 - Victorian green glass vase converted to a table lamp. LOT 688 - Composition sculpture signed E.R. Wertheimer mounted on base, 13", "Lovers". LOT 689 - Crosley walnut cased mantel radio. LOT 690 - Dutch Brutalist slate coffee table signed M. Kingma '90, 2'8" x 3'11". LOT 690A - Art Deco style metal floor lamp. LOT 691 - Oil on canvas indistinctly signed, 22 1/2" x 38 1/2", "European Village". LOT 692 - Acrylic Jane Basenae "Plimrose Fantasy". LOT 694 - Edward Bingham Castle Hedingham pottery four handled tankard, 5". LOT 695 - Art glass bowl signed Lalique France, 10", "Nemours". LOT 696 - Pastel indistinctly signed, 11" x 10", "Abstract Portrait". LOT 697 - Oil on board att. to Lynn Malin, 9 1/4" x 9 1/4", "Picnic". LOT 698 - Beechwood console table with mirror. LOT 699 - Pillars from India. LOT 700 - Photograph signed J. Karsh, 12.5"x 10", "Countess Margaret Alexander of Tunis". LOT 701 - Oil on canvas signed (Jeanette) Perreault, 24"x 18", "Etudiants au Tapa Bar". LOT 702 - Reproduction Bronze Statue signed C. Russell, 10 1/2". LOT 703 - Walnut magazine end table. LOT 704 - Uzbeinustani square rug. LOT 705 - Hammered copper bowl. LOT 706 - Teak end table. LOT 707 - Modern designed carpet approx. 5'x 7'. LOT 708 - Arts & crafts slag glass light fixture. LOT 709 - Bronze sculpture signed C.Komolmalai "Golden Goose", 5". LOT 710 - Set of six Bohemian crystal wine glass with blue flashing. LOT 711 - Teak draw leaf dining table and four chairs. LOT 712 - Modern black leather chair with foot rest, "Barcelona" style. LOT 713 - Bronze figured lamp of a man over a coal fire, 14". 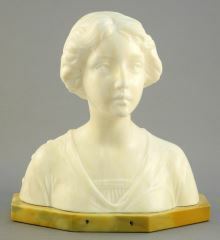 LOT 714 - Alabaster bust of a young lady with button on base marked Schumaker, 7 1/4".